I don't even know what to say about these cookies. Really. I should probably just let the pictures speak for themselves. These are little butter cookies. Not just any butter cookies, though. No. These ones look like watermelons. I brought them to a family cookout and the little kids could not. stop. eating them. Sometimes I don't know where to put things at family parties, so I just put my dessert on the table and walk away, knowing that somebody else will know the right place for it to be. This time around, about 5 minutes after I walked away, one of Joe's little cousins saw the cookies and asked her mom if she could have some. When desserts finally came out, she kept running over to get a couple at a time. OK, so then she turned to the brownies and chocolate chip cookies - smart girl. Seriously, though. These cookies are awesome. They're time consuming, but really easy. Most of the time, the dough is in the fridge or freezer and you're just waiting for it to firm up a little bit so you can work with it without making a mess or getting the colors mixed up. The log gets misshapen everytime you slice a cookie, so make sure to keep rolling it so that it stays somewhat round. It doesn't have to perfect, because you're going to slice the cookies in half once they come out of the oven, anyway. Do this part immediately so that you get a nice, clean cut. You might also want to sprinkle a little bit of sugar on top of these before you bake them. I didn't do this, but I think it would add a nice touch and a little extra flavor. 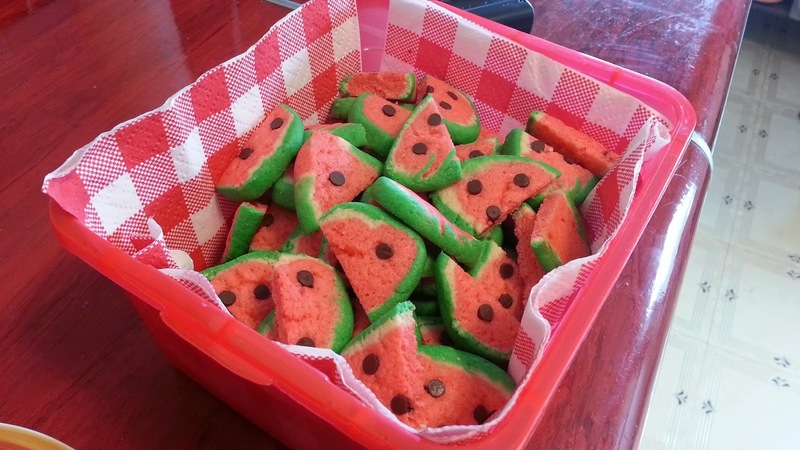 The sugar crystals would help them look like glistening, juicy watermelon slices. I left these cooling on the counter while I went to the dollar store to find something to put them in to bring them to said cookout. When I got home and saw these cuties sitting on the counter, I squealed with delight. The only bummer is that I forgot to set some cookies aside for me and I forgot to bring them home when we left the cookout. 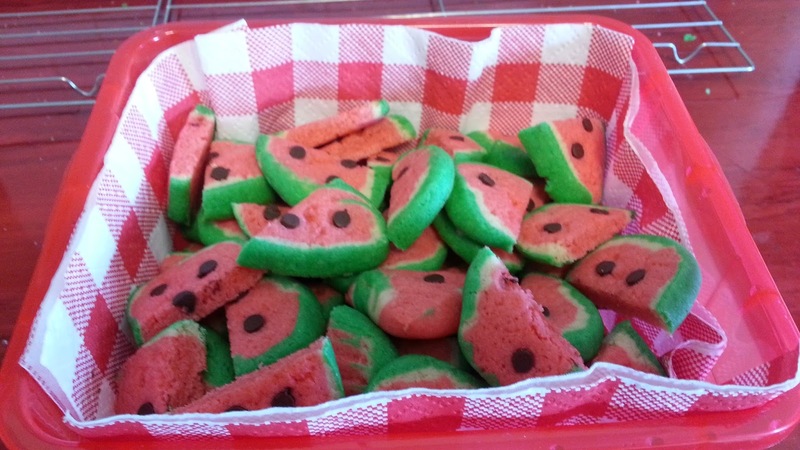 I mentioned making these to Joe again and he's going to see about getting me some watermelon extract (Google and Amazon say this exists - anyone ever tried it?) 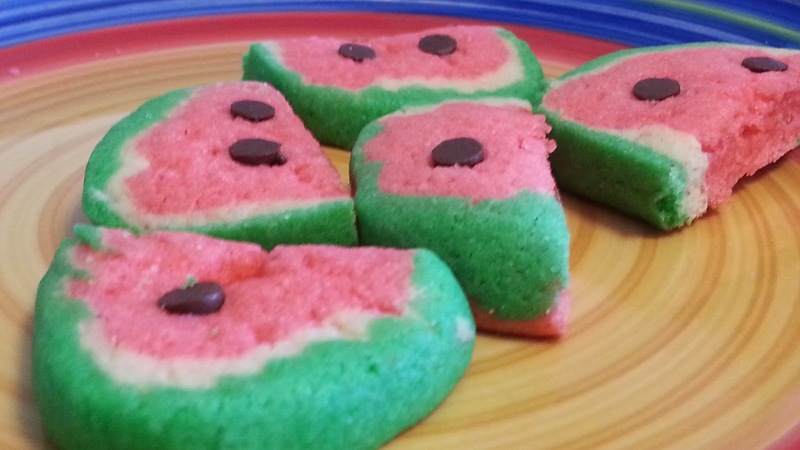 so that they can look AND taste like watermelons. What's the last food you made that looked like a different food? Tint remaining dough red and shape it into a roll approximately 3 1/2 inches long. Wrap it in plastic wrap and put in freezer to firm up - about 10-15 minutes. With the 1 cup of dough that you set aside, tint 1/3 of it green. Wrap it in plastic wrap and put it in fridge or freezer until firm. The 2/3 of the remaining dough will be left its natural color. Wrap in plastic wrap and put in fridge until firm. On a lightly floured surface, roll the plain dough into a rectangle, approximately 3 1/2 inches by 8 inches. Unwrap the chilled red dough and roll it up into the plain dough. Make sure you wrap it snuggly. Roll it around on the counter to seal the two layers together. Wrap back up and freeze until firm. On a lightly floured surface, roll the green dough into a 3 1/2 inch by 9 inch rectangle. Roll the chilled dough up snuggly in the green dough. Roll to seal the layers together. Wrap back up in plastic wrap and chill in freezer until firm. Preheat oven to 350°F. Unwrap dough and cut into slices about 1/4" thick. Every few slices, roll dough so that it doesn't get too out of round. Place cookie slices on an ungreased cookie sheet. Press mini chocolate chips into the red part of each cookie slice, pointy side down. Bake 9 to 11 minutes or until firm. Remove from oven and immediately cut cookies in half while hot. I used a small paring knife. Let cool on cookie sheet for a couple of minutes, then carefully transfer to a wire rack to cool completely.